For those living in Sussex, aside from house prices, we are all extremely lucky to call this area home. 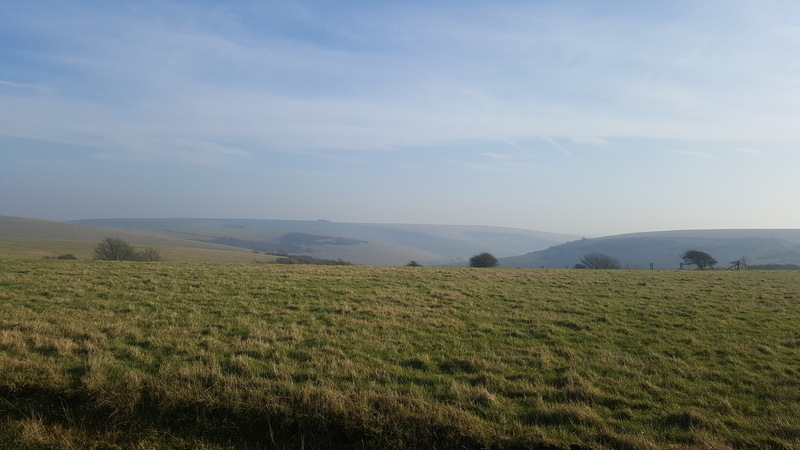 Surrounded by the beautiful rolling green hills of the South Downs National Park, there are many scenic walks and views to be found. We also have an abundance of small villages and towns where you can find comforting, homemade food after your ramblings. A friend and I decided to get out and make the most of the crisp but sunny winters day last Sunday. We met at the top of Elm Grove (both got the bus up thank you very much, there was enough walking to come) and walked up past the race course and turned left into the horse fields. If you drive, you can park just across the road behind the Downs Hotel on the corner of the Woodingdean junction and start from there, but you have to commit to walking back to it which is tough! The walk took around 2.5 hours all, so if you’re going to do it make sure you have water with you. Most of the terrain is very easy going, walking through grassy fields, but you will walk down steep areas so non-slippery shoes would be best (I learned the hard way) and something that wouldn’t matter to get muddy. The views were stunning! 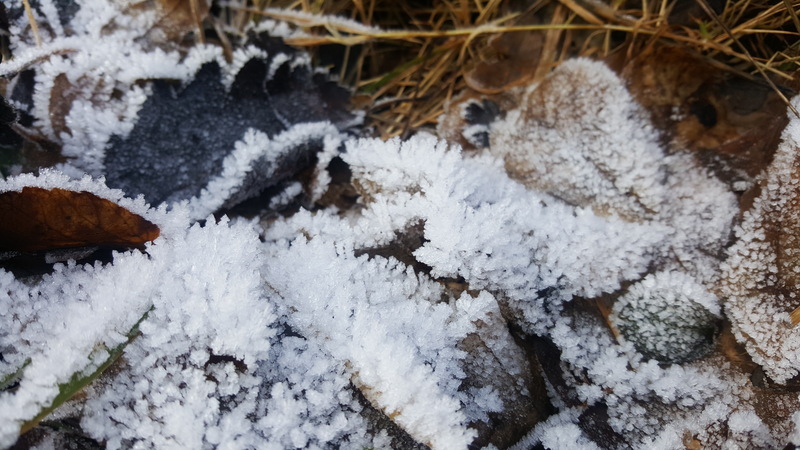 As we have had a lot of frost lately any shaded areas were glistening with ice, but then we had the sun streaming over the green fields that stretched out as far as we can see. We passed lots of other keen walkers too and everyone was super friendly and in good spirits with the sun shining. 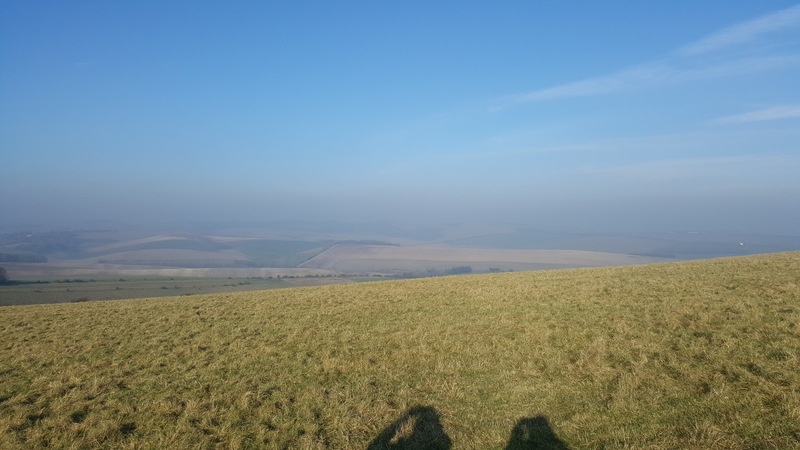 The whole walk is easy to navigate, you will reach a sign at the top of the hill which points you to Kingston or Lewes which is when you head down the hill. 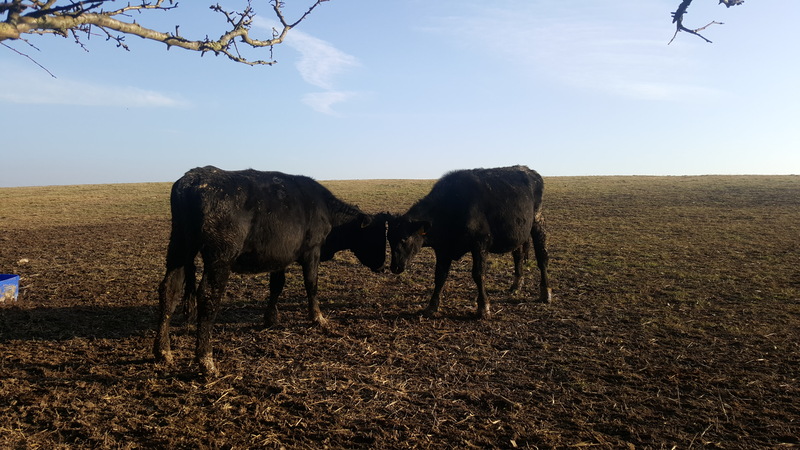 After reaching a road, you can either walk down the hill to Kingston and continue in that direction or cross the road and head up Ashcombe Way past an old windmill on top of the hill and paddocks full of cows. Eventually, you will reach the outskirts of Lewes so follow the road around until you reach the High Street and you will find many shops and pubs. Before we left I had reached out to Brighton Sunday Roast group to ask where the best roast is in Lewes. The answers were pretty evenly distributed over The Swan, Pelham Arms and Rights of Man so we knew without booking we would have a few to choose from! The Swan was the first place we walked past, a lovely old traditional pub tucked away on the residential streets. They were pretty much fully booked until late so we went to Pelham Arms at the top of the High Street. They had had such a busy day they were no longer able to take walk-ins, and the kitchen closed at 4. So, we continued down to Rights of Man which is also on the High Street but further down the hill and more central. The pub is unassuming from the front, but inside is furnished with dark wood and booths along the side, kind of like they have at The Better Half in Brighton if you’ve been there before. The bar staff greeted us straight away and by now we were ravenous, so very grateful they were still serving, yay! She kindly suggested we took a seat and she will come and grab our order soon. I’m rubbish and didn’t get any interior/exterior pics as I was too distracted by the thought of food! 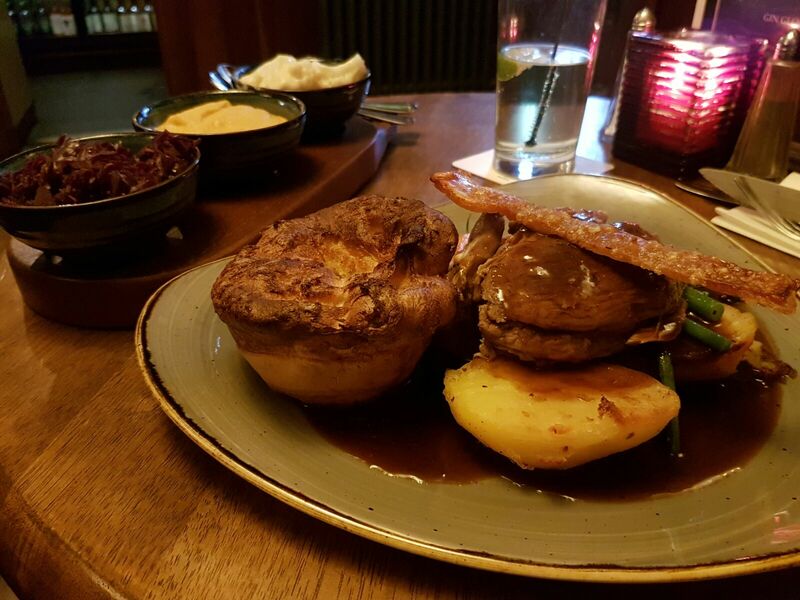 The menu on a Sunday boasts a number of starters, classic pub dishes, Sunday lunches and puds to keep everyone pleased. As it was about 3pm and the kitchen shuts at 4, there were a few things they were out of understandably so that was fine. For the roasts, there was a choice of lamb, pork, beef, chicken and a vegetarian option, and then they are served with roast potatoes, yorkies, gravy (obvs), and loads of veg! They ranged from £11.50 right up to £14.50 for the lamb so pretty standard prices for a quality roast I would say. 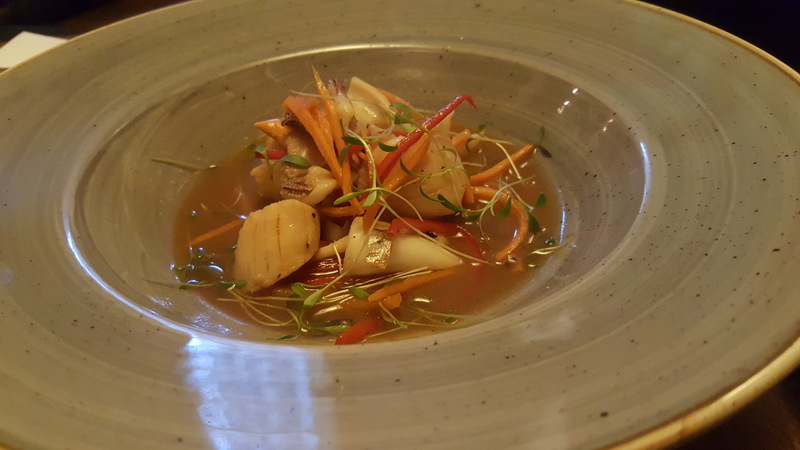 As we were so hungry I was eying up the starters, particularly the scallops in a chilli ginger and squid broth (£8) so I ordered them. They came out pretty quickly and were basically inhaled by the both of us. Both the scallops and the squid were still plump and cooked well, and the broth was tasty just a little salty for me. 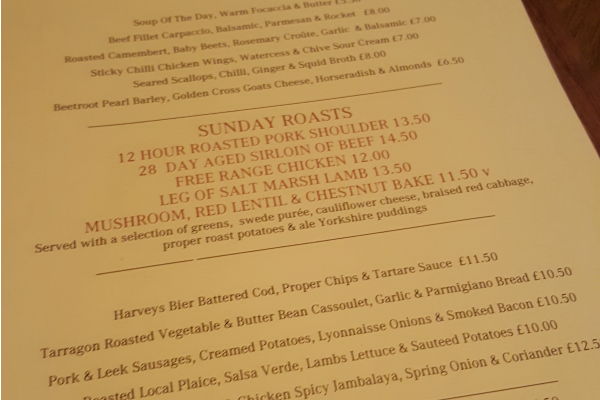 We didn’t wait too long after for the roasts, but our waitress still apologised for the wait which was sweet. 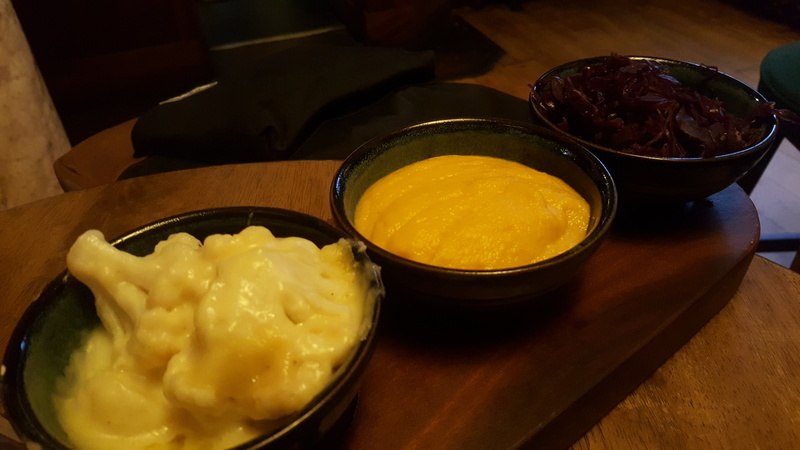 The veg sides were delivered first – braised red cabbage, swede puree and cauliflower cheese and we had a plank to share between us. Our immediate reaction was ‘I hope we get one each? !’, but it was more than enough as our plates were still stacked with other veg. 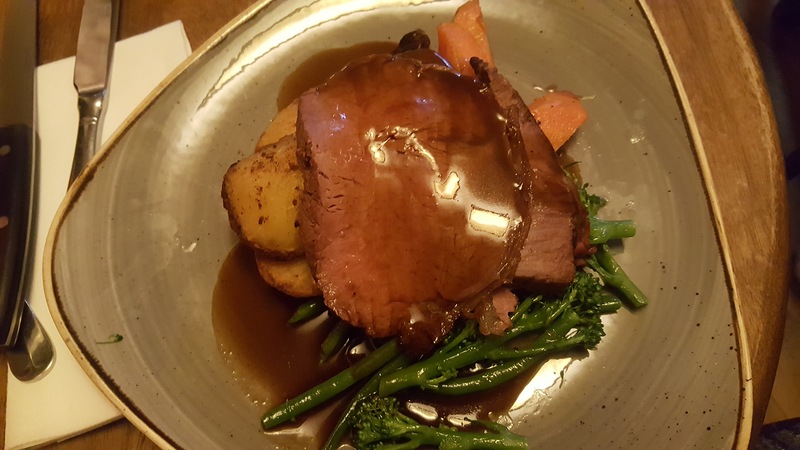 I chose the 28 day aged roast beef, (which I never order as have been let down too many times) but I had eaten every other meat on the menu that week!! I was so pleased with my choice, as the knife glided through the beef so easily and it was nice and pink in the middle. My friend went for the 12 hour roasted pork shoulder, that fell apart with her fork. She had a perfect slice of crackling on top that was some of the best crackling I have tasted (yes she shared it with me, that’s love), and the pork portions were plentiful. Considering we were there towards the end of the day, everything was still really moist! The roasties were well crispened, but not as fluffy as I would’ve hoped, and the gravy had a nice meaty flavour to it we could’ve just done with a little more on the plate. Saying that, when we did request an extra jug halfway through the staff were more than happy to accommodate. The veg sides were really tasty, the swede puree tasted mostly of butter it was amazing! The cauliflower cheese was as cheesy as one would wish and the red cabbage was sweet and delish. 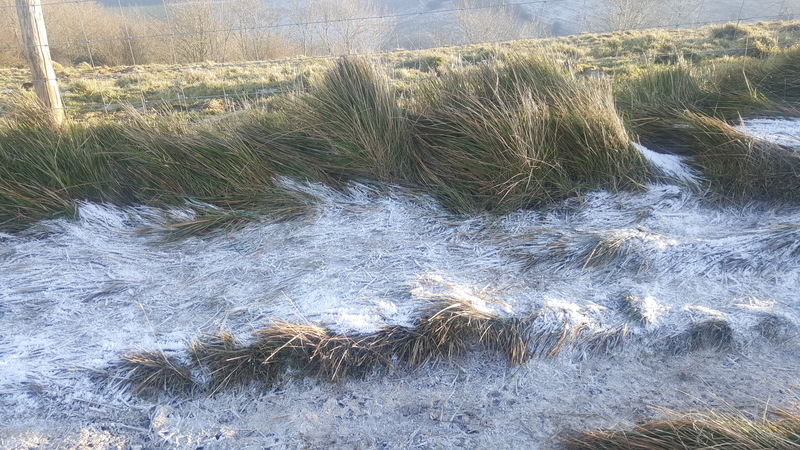 So I would definitely recommend the walk for a sunny weekend, it was really pretty in the Winter so don’t let it put you off. If you are going on a Sunday then absolutely check out the Rights of Man, the service was really great, and the food was worth the 2.5 hour walk for sure. I would probably suggest booking a table just to be safe, judging by the busyness of The Swan and Pelham Arms, once Rights of Man reputation builds I am sure it will be the same.